The Whitworth Hawaiian Club, Na Pu’uwai o Hawai’i (The Heart of Hawai’i), will share food and culture with the Whitworth and Spokane communities during the club’s 43rd annual lu’au on Saturday, April 13. The doors will open and dinner will be served at 5:30 p.m., and entertainment will begin at 7:30 p.m. in the Whitworth Fieldhouse. Tickets are $22 for general admission, $12 for students, seniors (65-plus) and children (6-12), $17 each for groups of ten or more and free for children 5 and under. Tickets are available for purchase at the Hixson Union Building Information Desk. There will be a 20 percent discount on ticket prices March 17-22 and a 10 percent discount April 1-12. Tickets will be sold full-price at the door. The annual event is expected to draw roughly 700 people from the local area. This year’s theme is “Huaka'i O Na Moku" which translates as "Tour of the Islands.” The menu will include rice, chow mein, Hawaiian sweet rolls, tossed salad, macaroni salad, teriyaki beef, kalua pig, shoyu (soy sauce) chicken, lomi salmon, pineapple, pineapple upside-down cake and haupia (coconut dessert). The entertainment portion of the program will feature a pre-show fair before the performances begin. This will include a hula hoop contest, the opportunity to learn how to do basic hula moves, and the popular Hawaiian game known as 'Ulu Maika. There will also be a raffle giveaway and an opportunity to buy authentic Hawaiian goods. Gaspar says that the Hawaiian Club hopes to provide the audience with an authentic and traditional lu’au. 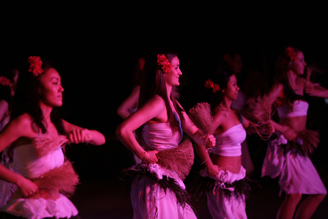 This year’s lu’au also will include a larger number of performers than in previous years. Anthony Gaspar, Hawaiian Club president, Whitworth University, (808) 345-2465 or agaspar13@my.whitworth.edu.